Obama and Romney fight for the female vote, Did Romney Offend Female Voters? 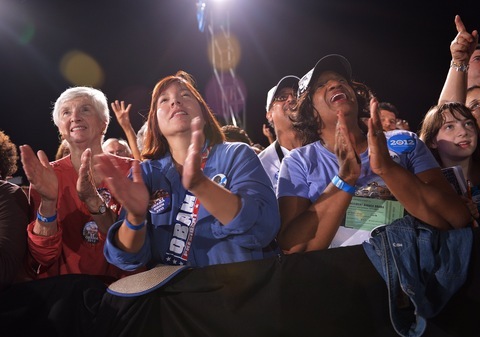 Supporters of President Obama applaud at a campaign event in Las Vegas last month. Photo by Mandel Ngan/AFP/Getty Images. Obama, Romney Step Up Pursuit of Women Voters PBS NewsHour (blog) For much of the race, Mr. Obama has enjoyed a strong advantage among female voters, but a recent USA Today/Gallup survey of swing states found Romney had narrowed the gap to just a single point, 49 percent to 48 percent. Did Romney Offend Female Voters? | Fox Business News Radio host Miriam Wallach discusses whether Mitt Romney offended female voters. 2012 Presidential Candidates, Michelle Obama and … abcnews.go.com Michelle Obama and Ann Romney join the debate over women’s issues.